Calidar takes another step forward. The printer delivered the book's proof copy yesterday. The UPS fellow left the box outside, at my door, and drove away without ringing my bell. Since it was a stormy day, this could have been bad. But I was expecting his visit, so I rushed downstairs and grabbed it. Before going further, I'll post a few pictures of the book for a sneak preview of the real thing. 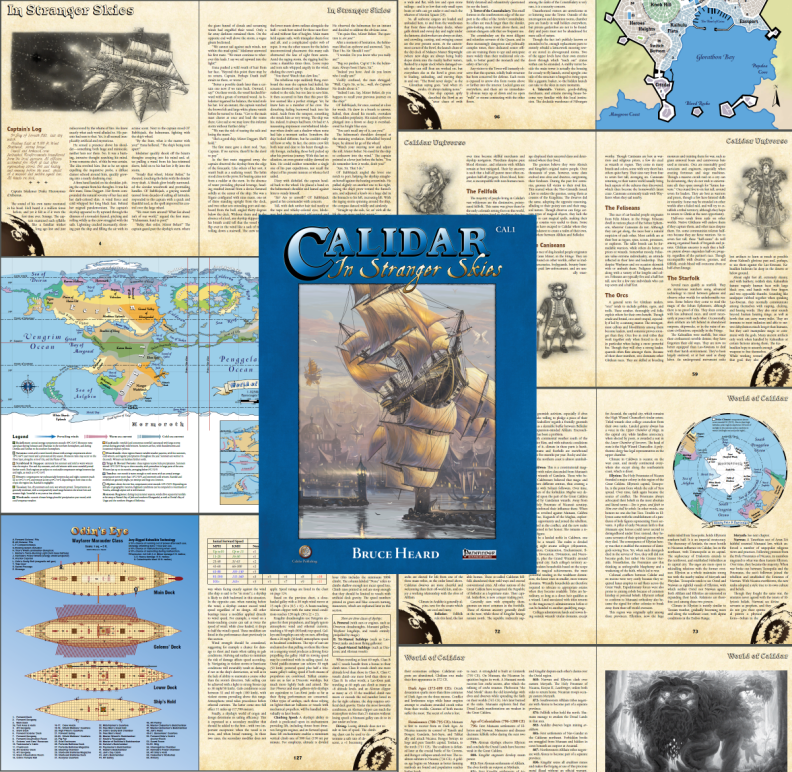 At long last, Calidar's book has been submitted to the printer. We're now awaiting to clear premedia (format approvals). We'll get an answer in the coming days. DTRPG's staff isn't returning from Gen Con until Tuesday 19th, so this might have an impact on timing. Next stop: either more alterations to the file or I'll order a pre-press version of the hardback to be mailed to me for final approval. I'll post a few pictures. Here's a montage of what the internals look like for your enjoyment. 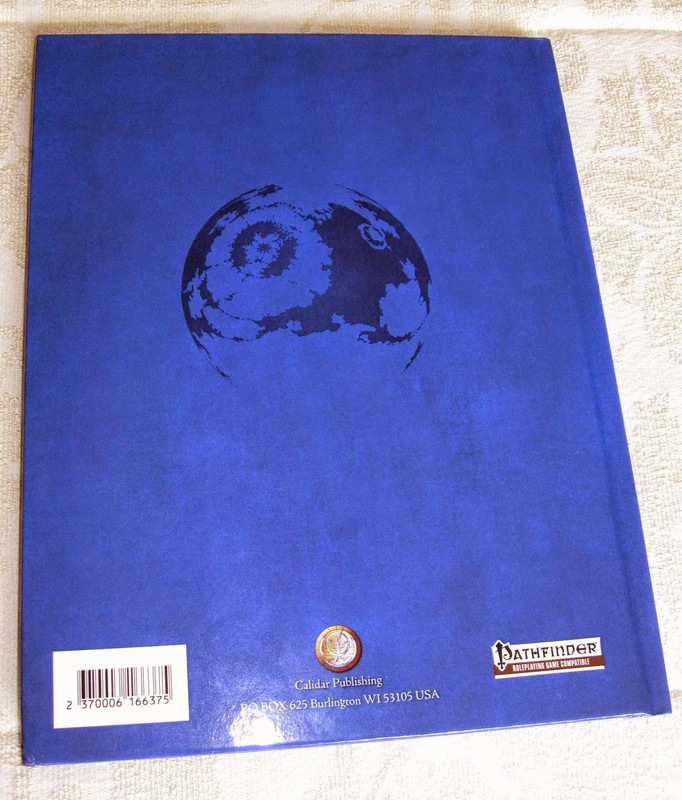 As soon as the hardbound book is approved, the soft cover version will follow, along with the various PDF documents intended for digital releases only, which include the book's main PDF, the Airman's version with just the Star Phoenix's story, and the release titled "Under the Great Vault" which is the compilation of the kickstarter short stories. We're seeing the light at the end of the tunnel! There were delays during the original layout process which swallowed yet another week's worth of time. Thankfully, Thorfinn stepped up to the bat and scored another home run, addressing successfully a number of unresolved issues. He smacked that ball over the fence and out of the park. I'd like to take the opportunity to thank him for his stalwart support of the project. His contribution has been above and beyond the call of duty. And don't miss his new page, on Google + or on Facebook. I think I would be remiss if I failed to post this here as well, since it has begun popping up in various places already this morning. 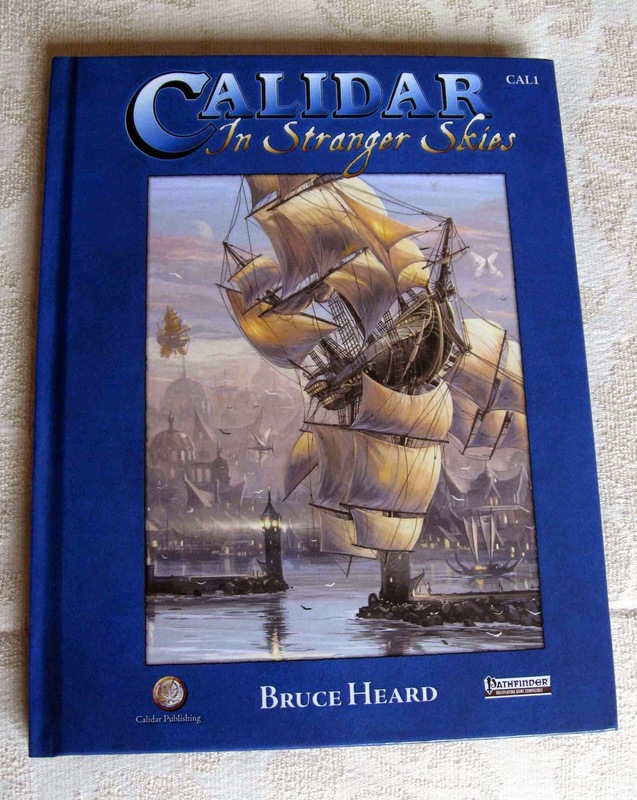 Thorfinn's awesome presentation works as well as a charming introduction to the World of Calidar as it does showcasing his skills has a professional cartographer. I'm certain at this point, Thorfinn is available for freelance work. I couldn't recommend anyone else's talents more to any publisher. I'll let you enjoy the tour and the lilt of his lovely accent.